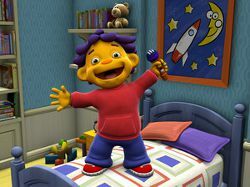 PBS's new series Sid the Science Kid stars an inquisitive boy with a knack for asking revealing questions; a companion science curriculum, offered in English and Spanish, helps teachers engage kids and build the skills the show's characters exhibit. Here’s a way to make the kids’ eyes glaze over: Tell them they have to watch an educational science program on TV. But plenty of children — and adults — have made science-based shows like MythBusters into hits. Turns out there is a place for TV in science education. And there’s a need, too: The “hard truth,” as President Obama recently said, is that Americans have “been losing ground” when it comes to math and science education. “One assessment shows American 15-year-olds now rank 21st in science and 25th in math when compared to their peers around the world,” Obama said. Prominent scientists from NASA and the National Science Foundation were invited to the White House event. So were a couple of cable TV stars: MythBusters creators Adam Savage and Jamie Hyneman. Everybody loves science when he or she is young. You cannot find a kid that doesn’t want to taste the kitchen floor. “I hope you guys left the explosives at home,” Obama joked. And not without cause: The MythBusters love to blow stuff up. It’s not a science show per se, but scientists are some of its biggest fans. Since launching the series eight years ago, Savage and Hyneman have been inducted into Sigma Xi, the Scientific Research Society. The California Science Teachers Association made them honorary members. They’ve been asked to speak at numerous schools, including MIT and Georgia Tech. Savage says they get the rock-star treatment when they visit. Recent episodes of MythBusters include “Can a sonic shock wave shatter glass?” and “Does double dipping cause germ warfare?” They go to great lengths to get to the bottom of these popular beliefs. And their experiments are highly dramatic. In one episode, Savage and Hyneman visited the world’s largest portable hurricane simulator — nicknamed Medusa — at the University of Florida to test whether it’s better to keep the windows of a house open or closed during a hurricane. Savage and Hyneman are quick to point out that they are not scientists — in fact they’re former Hollywood special-effects guys — and they didn’t create the show to educate. 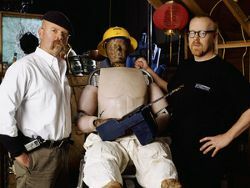 MythBusters: Jamie Hyneman and Adam Savage (with Buster the crash-test dummy) put science to work week in and week out on their Discovery show. But high-school science teachers approve. Mindy Bedrossian, of Strongsville, Ohio, says her students turned her on to MythBusters, and she thinks what the guys do on the show is “raw science at its best.” She even wants her students to test hypotheses the way they do on MythBusters: They study. They measure. They build high-tech props. They test — over and over again. Bedrossian says she pays close attention to what science TV shows are out there. She’s concluded there’s a lot of garbage. But her real problem is that schools themselves are offering so little science education in the younger grades. That’s where TV can help. There are a number of new science shows aimed at the very young:Dinosaur Train, Zula Patrol and Sid the Science Kid. The latter premiered on PBS last year, partly because Linda Simensky, the head of programming, was frustrated there weren’t many science shows for the pre-school set. So she commissioned the Jim Henson Company to create one. Sid asks plenty of questions. In fact Sid can be — how to put this nicely? — a little annoying. He’s an extremely happy extrovert who loves his toy microphone, and who’s hugely curious about how stuff works. Will the show actually impart any knowledge to little viewers? The producers aren’t making any guarantees. But they do hope Sid will get kids excited about science. According to Bill Nye, that shouldn’t be too hard. Nye stopped producing his show Bill Nye The Science Guy in the late 1990s, but teachers around the country still show it to their students. He says the U.S. needs young scientists — so why not start with this willing audience?